Single? Love Yoga? Want to try something new and connect with other yogis? 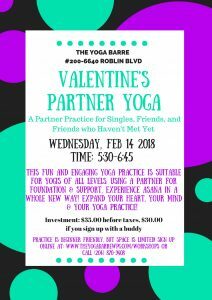 This partner yoga workshop will hep you deepen your practice physically and open your heart with the help and help of others. Go to www.theyogabarrewpg.com/workshops to register.